And then a picture of the closet and Bailey's bed. 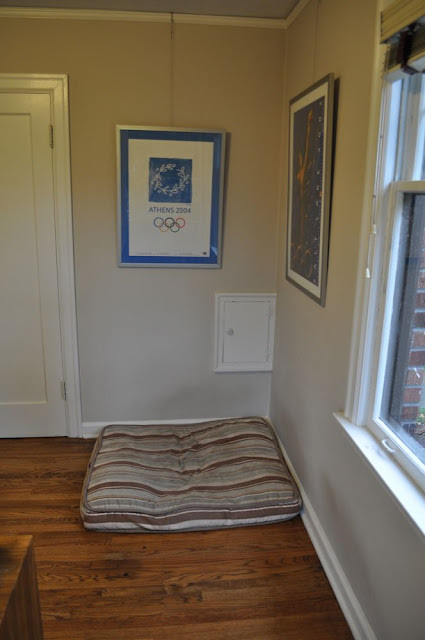 That small white door in the middle of wall is the laundry chute. Like this corner. It's under-utilized (sorry Bailey). I think it might be nice to have a comfy chair pushed into the corner, with a good reading lamp, and small table for placing a cup of tea, and a foot rest for relaxing the tootsies. Bailey's bed could be move four feet and there would be plenty of room. Of course it would cover up the laundry chute, but frankly, we don't throw much down it from this room, anyway. So that's something for us to work on. I've already started a pinterest board of comfy chairs but haven't found a winner yet. Chairs are funny things - there were several that I saw online at Crate & Barrel that I loved - and then hated once I actually sat in them. Clearly I should not buy my chairs online. 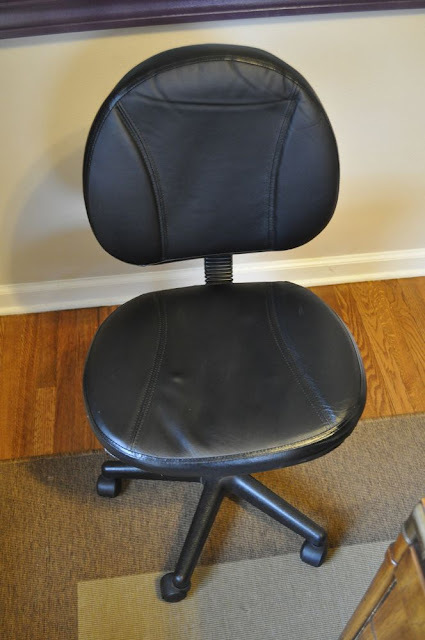 Item #2: The office chair. What can I say about this chair? Yup. That about sums it up. Time for a new one. I was thinking something with a little pizzaz. The problem with having the desk in the middle of the room is that, unless you have outlets in the floor, you're going to have cords snaking all over the place. Benjamin makes a bee-line for the cords the minute he sets foot in this room. Which is why he doesn't come in here very often. But for this little annoyance, I have a fix! 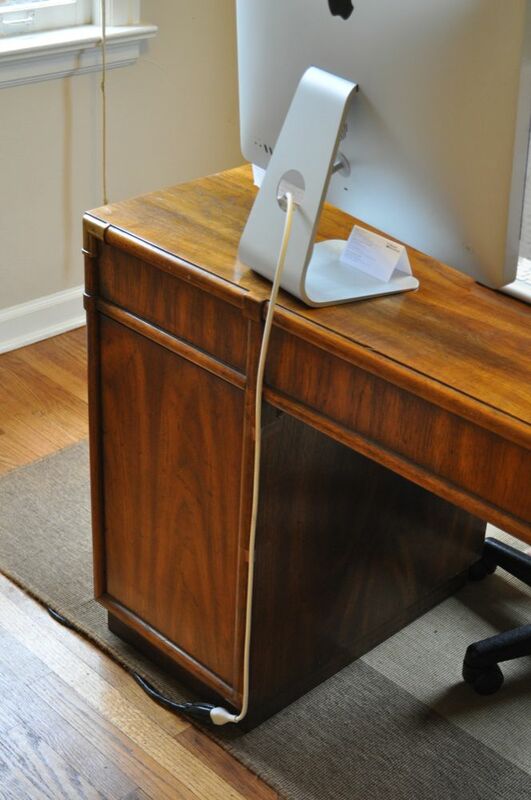 First up, I added an 8-foot extension cord onto the computer cable. Then I ran it directly down the side of the desk and then slipped the extender piece under the carpet. It's not a perfect fix. There is a little ridge under the carpet. But hey! Look: no messy cables running across the floor. 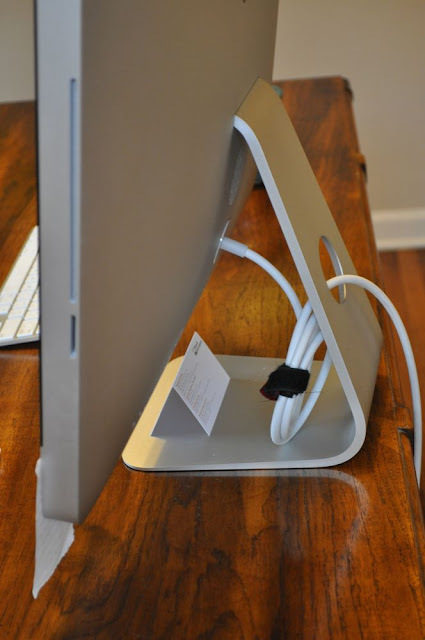 Then I ran the cords into a DIY charging station I made a few years ago. It's not the most beautiful thing in the world, and there are still some bits of exposed cables, but I think it'll work for now. Plus I now have a designated place to charge my phone. Which is good as I was constantly forgetting which outlet I'd left my charger plugged into. Only I would be so forgetful. The only thing that I'm not sure about is that the computer is now slightly to the right of center. I'm not sure if that's going to result in a sore neck or not but I'll let you know. So instead of power cords, the baby elects to play with a highlighter. I suppose that is a step in the right direction. We'll keep you updated on how the mini-office makeover progresses.